THE Independent Electoral Commission (IEC) has announced the final National Assembly seats tally after the 3 June 2017 elections. 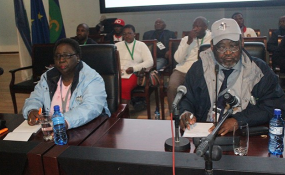 The All Basotho Convention (ABC) is the biggest winner, with 47 constituency seats and one proportional representation (PR) seat, with a total of 48. The ABC has also won three constituencies in which the candidates died before the elections. The IEC declared failed elections in Thupa-Kubu, Hololo and Teyateyaneng #24 constituencies. ABC candidate for Thupa-Kubu constituency, Afrika Makakane, Basotho National Party (BNP) candidate for Hololo constituency, Matela Leakae and Popular Front for Democracy candidate for Teyateyaneng #24 constituency died ahead of the polls. The constituency elections for the legislature candidates will be held after 90 days from the polls. The Democratic Congress (DC) has 26 constituency seats and four PR seats, with a total of 30. The Lesotho Congress for Democracy (LCD) has one constituency seat and 10 PR seats, with a total of 11. The Alliance of Democrats (AD) has one constituency seat and eight PR seats, with a total of nine. The Movement for Economic Change (MEC) has one constituency seat and five PR seats, with a total of six. The Basotho National Party (BNP) has no constituency seat and five PR seats. The Popular Front for Democracy (PFD) has one constituency seat and two PR seats, with a total of three. The Reformed Congress of Lesotho (RCL) has no constituency seat and one PR seat. The Basotho Congress Party (BCP) has no constituency seat and one PR seat. The Democratic Party of Lesotho (DPL) has no constituency seat and one PR seat. The Marematlou Freedom Party (MFP) has no constituency seat and one PR seat. The National Independent Party (NIP) has no constituency seat and one PR seat. Copyright © 2017 Lesotho Times. All rights reserved. Distributed by AllAfrica Global Media (allAfrica.com). To contact the copyright holder directly for corrections — or for permission to republish or make other authorized use of this material, click here.